New stock has arrived for the Ultimate Universal Power Supply! 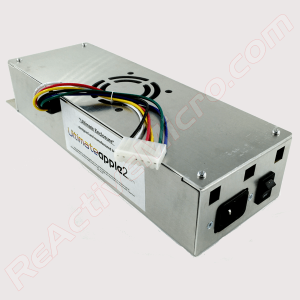 The Ultimate Universal Power Supply is distributed by ReActiveMicro. The power supply consists of the Ultimate Enclosure from UltimateApple2 and the Universal PSU Kit from ReActiveMicro. The enclosure has the Universal PSU Kit installed. Everything has been fully tested and is shipped ready to install in your Apple computer. Perfect for those who don't have a power supply or want an extra unit for backup. This is the simplest and fastest way to replace your power supply. You receive a whole power supply as pictured. Accepts universal AC voltages (90-240v AC) and operates worldwide. Available now for only $95 with your choice of IIe or IIgs cable. Or for $105 with Universal DC Output Cable. And as always, be sure to check out our Wiki for more information on projects or for support. And be sure to subscribe to our news feed to be the first to know about our next release! Just ordered two: one for IIe, one for //gs, and also picked up a new PSU for the //c+! Really looking forward to these new power supplies so I can run these machines without the constant dread of caps blowing!